Today’s prize pack is an exclusive giveaway valued at just over $200. We are giving one lucky winner a prize pack from The Body Shop and digital codes to the complete season one of HBO shows Sharp Objects, which was just nominated for three Golden Globe Awards, and Succession. 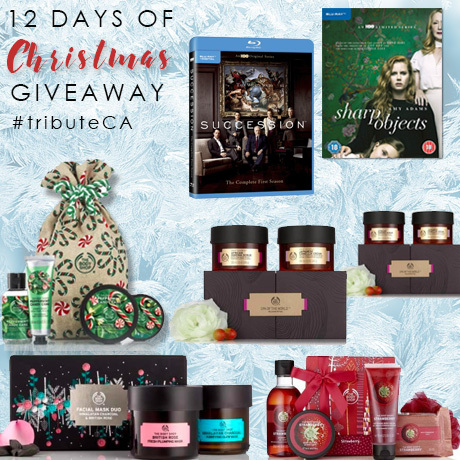 Make sure to follow our Tribute Movies Instagram for more (and different) prizes and to increase your chances of winning. First up is The Body Shop’s Spa Of The World Relaxing Escape Gift Set, $50, which includes Spa Of The World African Ximenia Body Scrub 350ml and Spa Of The World Japanese Camellia Cream 350ml. This set will transport anyone into spa heaven. Also included in this prize pack is the Peppermint Candy Cane Forest of Delights, $45, which will instantly spread Christmas cheer with the scent of peppermint candy cane. The set includes Peppermint Candy Cane Shower Gel 250ml, Peppermint Candy Cane Body Butter 200ml, Peppermint Candy Cane Hand Cream 30ml and Peppermint Candy Cane Shimmer Mist 100ml. We are also giving away the Facial Mask Duo Gift Set, $40, for the ultimate facial experience. This set contains the Himalayan Charcoal Purifying Glow Mask 75ml and the British Rose Fresh Plumping Mask 75ml. You and your loved one can cozy up with these decadent masks while watching Christmas classics. Last but not least, we have a Strawberry Festive Picks gift set valued at $20. It includes a full-sized body butter, body polish, shower gel and soap. From HBO, we have digital codes to the complete season of Sharp Objects, starring Amy Adams. It’s a dark thriller that will leave you at the edge of your seat. Click here to read the review and click here to see our set location visit. We are also giving away a digital code to the first season of Succession. I’m sure you would want to trade your family drama for the Roy family drama. Approximate value of the digital codes is $27.99 USD each. While one grand prize winner will receive the entire The Body Shop prize pack and Sharp Objects and Succession codes, we are also giving two other winners a chance to win digital codes for the two HBO shows. For a chance to win this prize pack valued at over $200, leave a comment below to tell us what was your most successful New Year’s resolution — or most disastrous fail. Don’t forget to check back Monday for our next giveaway! Congrats Dana Nelson on winning this prize! To laugh more and I am doing this daily!! My most successful is that annually I drink no alcohol from January 1 to March 17 (St. Patrick’s Day). It’s a great reset both physically and financially after the holidays. Least successful is dieting. I don’t know why I kid myself. To purchase a home of our own (with my husband).. and we did it!!! One year I gave up chocolate — no chocolate chips, no chocolate milk, no chocolate whatsover! and kept the resolution all year. Successful, but not very smart. Why give up something I really, really loved? Resolved to spend more time together as a family and we did! My most successful New Year’s resolution was to lose weight cross-country skiing. It worked really well as I was single at the time and had the time to go every day. My most successful New Year’s resolution was to write more Thank you cards. My Grade 3 teacher Mrs Lam taught me to write Thank You Cards in her Arts class and she also taught me to be more grateful. healthy living – i lost to a chronic disease – so I MUST stick to my resolution to take care or else… disaster as you say. to eat less Junk foods! To spend less on take out, which went well for a couple of months anyway! To forgive myself and let go of past hurts. Very cathartic. Several years ago around this time, I decided to cut toxic ppl out of my life. One of the best decisions I’ve ever made. Stress free. I wanted to lose weight for a trip many years ago, and I did!! I felt awesome!! Dieting failure, like most people. Successfully not taking life too seriously. Successful – back at the gym and haven’t quit. Got back into shape. Fail – quitting potato chips ha. My most successful resolution was to travel more and enjoy life everyday!!! It’s still working out quite well for me!! My resolution was to reconnect with family more. Proud to say that I actually accomplished that. To reach my goals with my work!! Thanks! My biggest fail is losing weight, struggle with that every year! I decided in November 2017 to lose some weight. As of today I have lost 15 lbs but seem to be at a standstill so will have to be very attentive over the holidays of what I eat. No sweets, okay with me, but turkey, I love Turkey and Mashed Potatoes. Going to be hard. Most disastrous seems about right for me. Its usually to spend more time to work on a specific skill or hobby and I wind up in a tangent of half starting a dozen others. 2019 will be my year! My most successful New Year’s Resolution was to return the shopping carts to the designated area of the store before leaving. I have stuck with it for over 3 years now. I resolve to lose weight – it’s the same resolution every year! Thanks for the generous contest & chance to win!! my most successful New Year’s resolution was to read at least 50 book per year. so far i’m on 53-th book and the year is not over yet. My New Year’s resolution was to finally love myself and take care of my body. It was slow going at first, but I am now down 45 lbs. and stronger and healthier than I have ever been in my life!! Self care is the priceless. Every year my resolution is the same: Lose weight and exercise more. One year I’ll make it! My most epic resolution fail was the year I decided to cut out out sweets and junk food. That last until they brought out the desert tray 10 minutes after midnight. My successful resolution was to keep busy creating my dot mandalas and meditate while creating to release stress and chronic pain. Works like a charm. Hmm I would say my biggest new years revolution is spending less money and saving more. I have been sticking to my budget for the most part except when it comes to Christmas shopping. To keep consistently active. I’m having a couple weekly gym sessions which is nice. Did meet the goal. Last year I resolved to be more mindful and appreciative. I wasn’t able to maintain daily, quiet meditation, but I consistently try to live with more mindfulness and awareness for others. Trying to stay healthy is always my resolution. I’ve managed to get to bed earlier all year! I do not make new year resolutions there for I can not break them. I know I won’t keep to them so I do not make that promise. To lose weight, and I’m getting there slowly. Walk everyday and lose weight. It’s success. Thanks. I successfully gave up french fries for 6 months! To get our group of friends together at least once every month. Tough thing for adults with families and jobs. Spend less on takeout coffee! My best resolution was I successfully quit smoking after 25 yrs of smoking. Wish I did it sooner but so glad I finally did it. Mind you it did take a few times to achieve but I have been smoke free for almost 2 yrs now. Yay me!!!! To go the gym and get in shape – now at over 600 visits and I’m looking good! My only successful resolution was to not make a new year resolution. No fail. Higher self-esteem. My most successful New Year’s resolution was no more late night snacking! I am not very good at resolutions. One resolution was to walk every other day and I did for the first few weeks till I fell and broke my ankle. No more walking for a few months that year. I don’t bother making resolutions – however view January 1 as a fresh page, new beginning! As a NY resolution I was setting myself up to fail so nevermore.I tried to quit smoking 5 times failed miserably.I am try #6 cut it down 55% by going outside. I failed to lose the weight I promised myself I would try to do. My most successful New Year’s resolution was to go for a walk/bike every day. The best NY resolution ever is to choose happiness! mine was to spend more time for myself,and take up a new hobby I did and feel better and less stress! My New Year’s resolution was to spend more time with family, which I’m glad to say was accomplished this year! My biggest new years resolution fail would be to quit smoking but this year I plan on sticking to it! The only resolution I make is to stay positive (which can sometimes be tested in a stressful world) and enjoy this season with my beautiful family. The best resolution I ever made, was to not make New Year’s resolutions. My most successful resolution is not to make resolutions! I just try to make small changes and hopefully that will help me reach my goal without feeling all the pressure! Becoming Vegan, 3 years ago! My most successful one was many years ago when I decided to do menu planning and grocery list for the week! Still doing it!! Thanks for the chance at this awesome giveaway!! I’ve not made a New Year’s resolution in about 25 years. The only one I ever made was to give up smoking and it worked for 2 1/2 years but then bingo! So that was a bit of a success but a failure in the long run. My most successful new years resolution was getting my drivers license!!! I didn’t get it on the first try but I did on the second ! My most successful new years resolution was quitting smoking over 4 years ago and still counting. I be more organized and get rid of things I don’t need. To get outside more – and I have been. Feels great! My New Year’s resolution was to make better food choices and less snacking – and that has resulted in a 15 lb weight loss! Now not to regain it all back eating Christmas goodies! Quit smoking 8 years ago; feel so much healthier now!! Best resolution was to get more active. I took up co-ed sports and walks with my wife when we could. This has let me feel more energized and even lost a little weight in the process, as well as make some new friends. My most successful was getting in shape and my most disastrous was back when I was trying to quit smoking – a resolution to stop never worked – it had to happen when I was ready. I always say I’m going to lose weight and exercise more regularly. I think I’ll stop, because if I don’t feel obligated, I do exercise. But if I think I HAVE to, my brain goes, “Nope, haha”. My 2017 New Year’s Resolution was to lose 50 lbs and by the end of the year, I lost 54 lbs! Tried to get a head start on being healthy – fail, broke my shoulder walking the dogs on New Year’s Eve! Best New Year’s Resolution/ Laugh!!!! It worked, feel better!!!!!! I made a resolution a few years ago to never make a resolution again, and I haven’t broken it since! I quit smoking, that was my best new year resolution! I usually don’t make New Year’s resolutions but last year I made a promise that I would put myself in situations I am not always comfortable with – like meeting new people. It has worked well for me this year. I don’t think I have ever had a successful New Years Resolution. Only epic Failures over and over. Maybe this year will be different. My most successful New Year’s resolution was being more organized. I managed to organize a few places in my home. I plan to continue this next year. Doing the exercises to strengthen my knees – some days too lazy & missed but kept trying & still doing most days! Every year I vow to loose weight, and usually am not successful… however last year I vowed to simply love myself as I am, and to stop talking so negatively to and about myself. While I have a long way to go still, I definitely love myself a whole lot more than I ever have and I enjoy this journey much more than what it has always been! I few years ago I committed to taking scheduled yoga classes and it worked. My most successful New Year’s resolution was to start drinking more water and less pop – I’m glad to say I have stuck with it to this day ! My most successful resolution was to continue my exercise regime, and I have been doing so! New Year’s Resolution is always to talk less and listen more. I have been gradually improving year after year. Success! Finally, after being injured in 2010, becoming disabled for almost 7 years from it, getting no help from my health system to diagnose the problem, etc….suffering major depression and such…..I finally got the desperate help and diagnose I had been needing and asking for since day one (despite all the doctors thinking I was “faking” everything…or them just being “fakes” themselves when we “thought” they were supposed to be helping me the whole time). I was treated and diagnosed at UBC in Vancouver…..and am once again walking, sitting, standing, and “almost” back to my usual self again thanks to the team that “cared” enough to truly figure out what was going on inside me. Because of that, my wishes came true, I have a new lease on life again….and even have found a beautiful person to start enjoying life with….and life is just amazing for the first time ever in so many ways. I lost all my baby weight last year 40+ lbs!! It was excellent, but I’m pregnant again and slowly gaining it all back lol. A win and a fail I guess haha. In 2018 I made the resolution to reduce my sodium intake. For the most part it’s been successful, but I have my moments where I indulge. My resolution is always to eat healthier, but I never seem to keep it, so I guess that’s a fail! Only resolution I’ve ever made was to Not make resolutions- so I’ve been very successful at keeping that one!! All of these would be great for my wife. She gives everything she has every day. I would love to see her be pampered. My resolution was to be more organized which lasted a day! Most successful New Years resolution: Settle down and meet the right one. I was telling myself every year to meet the right one and stop dating and ending things with women for (in retrospect) insignificant reasons. I finally manned up and took a chance on the woman I can’t live without. 6yrs later, 2 kids and a great new build house. Most disasterous: Quitting chips/most junk. My best resolution was to marry my best friend that I grew up with and reconnected with after 25 years. We married January 2, 2015 and it was the best decision ever. He makes me laugh every day and happy to be alive. A resolution this year was to travel more and I did. I also wanted to get my drivers license but that’s going to have to be made next year. Lose weight = always a fail for me!! To eat better and lead a more healthy lifestyle. My most successful resolution was to go back to school and get my accounting designation. Signed up right away and stayed with it until I got it a few years later. My resolution was to lose weight but I only lasted about 2 days and then finished off the box of christmas chocolates. All my past resolutions resulted in fails, so I don’t make them anymore. And now I’m all the happier for it! Every night the last thing I do is say five things I am grateful for. My most successful New Years resolution was not to make any resolutions other than the general try to be a better person. My new years resolution was to get better sleep. And on New Years day with a little help from my friends Jack and Daniel the night before. I pretty slept much the whole day. I tried to eat more healthy than I have in the past and think I succeeded. To drink less soda/pop. I’d say in the last about 5 years, I’ve only had it maybe 10 times! Most successful is 3 years ago deciding I would finally take care of my mental health and start going to therapy! My most successful was the year I quit smoking. 11 years and counting! It was 1918 and it was simply to “HAVE MORE FUN”! And I have had more this year already! Get to bed by 10:00 p.m. weeknights. Epic fail so far. Most successful is losing weight and adopting a healthier eating lifestyle. My most successful New Year’s resolution was to start eating healthier. To stress less about things. It worked and I’m happier. to make no more resolutions!! This year was the ONLY successful ever ! Simply to HAVE MORE FUN! And I certainly have ! To meet new people! I have spend most of 2018 in AirBnB(s) so I am doing it and it has not been by choice. I said I wanted to drink water more and I am doing a good job of it most of the time as I know it is good for me and I want to do that to help with my skin and weight and so much more. My most successful resolution was to lose enough weight and endure enough exercise to ‘see my waist’! I am pleased to say that I HAD done so last year, however this year is another story…back to the ‘drawing board’. To eat healthier and keep a food journal. A journal always works for me. Never ever made a NYE resolution. To stop smoking I didn’t! My most successful New Years Resolution was to walk everyday and I do. To travel to places on my bucket list. Getting lost while travelling. My most successful New Year’s resolution was becoming more active. Last year I made a lot of changes to my activity levels and have stuck with it for the past year. Exercise is normal now at 4-5 days per week. I’ve lost weight and feel great! To revamp my living room, I was on a mission, paint brushes were flying and changes were happening! The year I actually quit smoking was my most successful resolution! To travel more and stress less! To stop sweating the little stuff and not let it bother me. I have much more patience these days. My worst fail was to quit smokingI have “graduated” for every “quit smoking” program out there and I still have that filthy habit. My most successful New Years resolution was to do a kindness for someone every day, which I have been doing for about 20 years. My most success resolution was to go to the public library regularly, take out and read more books! I seem to make the same resolution every year, go to the gym and lose weight. I start off strong and then after a month or so stop going. My most successful resolution, was when I promised myself that I would finally leave my abusive husband. Best decision I ever made. Was a huge reader and stopped reading, made a resolution to read one book per month! Been going pretty so far, though I had to count IT as multiple books because at almost 1200 pages it took a while to read! To Quit smoking it lasted 6 months. So was a fail in the end. But I have been smoke free since September and plan to stay this time. I resolved many years ago to not make any new year’s resolutions and I have succeeded in not doing so. To make more time for relaxation! Quit drinking pop for good! Most successful, watch what I spend, I now do not impulse shop, I think about it and a lot of the time after thinking it over, I do not buy. Making resolutions is not really my thing but for many years, I didn’t think about losing weight and this year it finally happened! To eat healthier. Kind of successful. Lol. My most successful resolution was starting a weight routine and sticking with it. My most successful New Year’s resolution was never to take people for granted and to tell them I love them often. I sort of succeed and fail being healthier every year. My most successful New Year’s resolution was never to take people for granted and to tell them I love them often. Weird it says I said this before but it is not showing up in the page? Just to do better then last year. To be more active and travel more. I managed to see a lot of different countries last year. My most successful New Year’s resolution was to practice my guitar daily. It started out as a real chore but over time has been has become something I really enjoy doing. My most successful resolution is no more resolutions. Keeping up with my emails – disastrous! My most successful resolution was to get more sleep – I made sure I turned off my cell at night! Biggest fail every year : being more active! I successfully picked up a new exercise class that I still regularly go to (barre). Taking the bus to work, walking to and from the bus stop, only to bugger up my knees and now arthritis has attacked my back and knee. So much for trying to get fit. I don’t really make New Year’s resolutions but in January of 2012 I decided I wanted to get in better shape. I worked hard to change my lifestyle and lost nearly 40 pounds. I’ve never really done resolutions. I just try to be a better person, inside and out. I need to work on my self. I’m a good person, I just have to believe it! Most sucessful was getting rid of toxic people and least sucessful was not eating seafood. I can’t stop the prawns and butter man….just can’t stop…. Refused to make any resolutions! Just take the coming New Year as an Adventure. My resolution over 10 years ago was to make time to do a daily walk of at least half and hour. I have only not done one when we have had too much snow on the ground as it was too risky to walk. My resolution is to keep my kids happy and make sure they have what they need. I like to try and consume less sugar and eat healthier. Wake up before 5AM once per week and accomplish something off my to-do list. 49 weeks later and I am far more organized than ever. My new years resolutions never last longer than a day or two. They always have something to do with a healthier diet or looking and feeling better about myself. My most successful New Year’s Resolution was to breathe deeply, move forward as positive as I could after caring for my Aunt, out of country, for over 6 months with pancreatic cancer, and my Mom home needing help with dementia. I pulled through, and now home, make my daily trips to see my Mom who will be 96 in April. My husband is my hero making every New Year a success for me. To eat healthier and exercise more. Failed at that. Made a resolution to read at least a book a month. Read 2 books the first month! Haven’t read one since. That was 3 years ago. My most successful New Year’s resolution was to make a list of things I wanted to accomplish during the year. I got the list made but was not able to fulfill everything on it. Apparently, I made a 5 year list! Lesson learned was to be more realistic and only try to accomplish one or two things per year. I did get some house cleaning/purging done which was wonderful, and I did get my flower beds redone and they look great! To actually finish a craft project before starting another! Sad to say it hasn’t worked I still have bins of half completed projects! Not sure if this is a success or a fail as it is always in a work in progress….but every year I pledge to let go of the negativity and not stress over the small stuff. Better sleep habits and it helps me a lot! Take time to relax…I guess I’ll have to try again this year!! To read a book a week. Total success! At 58 and counting. To not make a resolution and I’ve been doing that for years … success! To cut my sugar intake! Success. No sugar tonight in my coffee 🎼 or anytime for that matter. Feel so much healthier for it! My resolution greatest success was deciding to have the surgery that ultimately saved my life! My most successful resolution was losing weight (30 pounds!). Be more positive, success. Stick to a gym routine, fail. Is it too cliche to say the gym? I’m half succeeding and trying out new classes so that’s a win for me! To stop worrying about things that I cannot change. To try to exercise more! My New Years resolution was to go to college, now I’m in Culinary Management. My best New Year’s resolution was to take time for myself and try to relax a little! Most successful – to “unplug” for a couple hours every day… to focus on “me” time, without distractions of TV, computer/social media, texting, etc. To run a marathon – and I did! Leaving work at work! Best resolution I ever made. To take time for myself and learn to laugh more! To get out more and become more active! 43 years ago I resolved to ask my girl friend to marry me. It surely was the most wonderful time of the year. She said yes. Thank you wife for 43 wonderful years. Mine was to stop buying so many books that I could never get around to reading them all. Then I would take up too much space and have anxiety over never finishing the pile. Now I only keep one or 2 on my nightstand. My most successful resolution was to quit smoking. And I did. to eat healthier….I am doing pretty good at this one…as opposed to losing weight! Would love to win because my birthday is coming up! I don’t typically make resolutions, but I would say that my biggest fail was planning to drink a lot more water. It’s been pretty steady, at least, but I’m just not a big fan of the taste. My resolution was to eat less fast food and more home cooked meals. So far so good. Saving money too but I’m craving fast food at times. Je voulais faire du vélo toute l’été je n’en ai fait qu’une seule fois! Most successful New Years resolution: not making one. Je voulais perdre du poids et j’ai réussi grâce à mon entrainement régulier. Spend more time doing things I enjoy for example reading a good book. To fill in a gratitude journal every evening…helps me to be happier and live each day to the fullest! My failed resolution was to work out every day for an hour. A week into that I started getting heart palpitations and the doctor told me to stick to walking, not the gym! My successful resolution was accomplished because I walked more on the trails behind my house. Also, to go and see more movies with family. Thanks, Tribute for movie ides. To be happy and to spend more time with family. When I was a kid I would never wear my glasses. My first New Year’s with them, I resolved to wear them all the time. It worked! I resolve to not to resolutions. Success every year! My most successful one was to begin working out 4 times a week. To lose 10 pounds in one month. Very successful however 3 months later I gained it back. Relaxing spa day and a great watch on the tube! What more could you ask. Most successful was to lose weight. I had a great year of getting out more often and spending more time in my community! My New Years resolution is to go to gym more often!! Get healthy – lost almost 30 lbs so far! Never make a resolution. It works! To quit smoking, I failed. I had the most success when I resolved not to go on a diet that year! Best resolution success, gave up chips40 years ago. Rarely eat them , to date. Well I used to make resolutions every New Years, always failed! then last year I decided not to make any and it worked for me!!!!! no more fails!! Pretty much every year it is my resolution to eat better and exercise more.I have actually doing better with this since the fall. Merci beaucoup pour vos concours . Count to 10 before dealing with a difficult situation. My most successful New year’s resolutions was to stop biting my finger nails. Biggest success was the resolution that I made to make sure to take 5 minutes for me each day! At first I felt selfish, but my stresses melted away!!! My biggest failure was to exercise a lot more in the New Year. Never happened! Best NewcYears was setting off fireworks on the beach to ring in the year ahead ! For 2 years now I’ve made a resolution to learn how to crochet but so far have nothing to show for it. Maybe the third year will be the one that I complete this resolution. I never do New Years resolutions, can never keep them anyways. To take steps for a healthier body, mind and spirit. It was slow process but I think a positive outcome so far. My resolution was to clean and organize a room a month- I made it to July. Perhaps I can finish the list in 2019?? To cut out all sugar from my diet. finally kicking the smoking habit was my most successful resolution for the new year! To quit smoking, I have been non-smoker for 8 years now! I would say all my resolutions have been a disastrous fail. From traveling more, going outside of my comfort zone, reducing my hoard, being less judgmental but we are all human and we can’t be perfect so appreciating each day as it comes. Thank you for the opportunity to win & share. One year I resolved to quit smoking for good, that was 16 yrs ago! Did not make a New Year’s resolution. I make the same resolution every year that is broken the instant I make it, which is to not make any resolutions. Most of my resolutions have been fails. The closest successful resolution was when I resoluted not to make any resolutions. My most disastrous New Year’s resolution was to avoid scandalous situations. To eat less chips and popcorn. My most successful New Year’s resolution was to venture forth and change careers in my forties. It was a scary prospect, but it worked out for the better. The easiest New Year’s resolution I’ve been able to keep is to have more fun in the new year. To settle down! she said yes! My most successful New Years Resolution was in 2013; I had laid out a plan to get ahead in my career and I did it… That year, I moved ahead 3 promotional spots and defined my role at the company. To stop grumbling about New Year’s resolutions – fail. Last year I resolved to get a hobby. I started taking pottery classes and I love it! Not to worry so much…didn’t work. Writing in my gratitude journal every day was a huge win! Exercise more – epic fail! I primes to exercise everyday and i’m still doing it. keep going! I got rid of old regrets… I put them behind me and struggle to live in the present. To ensure I get some me time every weekend, and I do. It feels great to dedicate some time to myself no matter how busy I am. Be present and enjoy the little moments in life! I tried to Eat healthy. I grilled, baked and ate more greens, it worked and I succeeded. Every year I say I will try to relearn French…but it has yet to happen. To finally quit smoking, which I did! Almost up to my 1st year anniversary. To get out and walk more instead of driving ! Didn’t make any, just to live each day the best I can. far, I am two out of four. I don’t even know! I can’t even remember what mine was last year lol It was something so general, like try new things. I haven’t had anything successful or disastrous. My most successful resolution was to keep up with the laundry on a weekly basis so it doesn’t pile up until we reach the point of not having anything clean to wear and so far this year it’s been working and the year is almost done!! My most successful New Year’s resolution was refinishing an old wood filing cabinet. I usually don’t make New Year’s Resolutions, but one year I decided to live a healthier lifestyle by exercising more and choosing healthier foods. It worked out pretty good for about six months. My New Years resolution is always to have more fun in the next year. My most successful new year resolution was about 15 years ago, when I swore i would never let anyone disrespect or abuse me. I left the relationship I was in, and started new, and have not looked back! To work out more and get healthier…I’m still working at it..sometimes it was successful and other times not so much. I don’t make resolutions because I know the stress it brings for one to succeed. Wellllll, I’ve been resolving to get fit every year for the past decade… Overall, I’ve gotten slightly more fit overall.. so I’d put that in the passable fail column? A few years ago I made a resolution to take a walk each and every day. Most successful is to drink more water and sleep more! Always vow to exercise more in the New Year and I usually do for awhile. I have actually had two successful resolutions that I kept over the years. I had to get a new one as my first one was to make sure I rolled and cashed in all the pennies I saved over the year. I didn’t want to be responsible for the mint discontinuing it. (Insert smiley face here). Once that fell to the wayside, I decided that my resolution each New Year is to do at least one random act of kindness each and every day! It is quite actually a great mood booster and I often do more than one each day.I plan on doing it in 2019 as well! I resolved to travel more and worry less about work, and I think I’m off to a good start, 21 countries and counting! To find some peace in my life. I resolved to stop stressing over things I can’t change. Save money for a trip. It was fantastic. None of mine have lasted any time. Disasterous all! I gave up on New Year’s resolutions many years ago and it was the best decision I ever made. To travel more and save money. To finally repair my van – didn’t take. My most successful resolution was giving up caffeine. I had headaches for a few days, but after that it was easier. My worst New Years resolution was that I was going to stop drinking Diet Pepsi, well that lasted maybe a day? Maybe, and now I drink like about 6 a day. Ugh. My most successful New Years resolution was to quite smoking! I told myself I was going to walk at least 30 min every day…walk to get coffee instead of drive etc…..that lasted a couple of weeks and then I got distracted and forgot about it….there’s always next Jan!! Quitting smoking! I can breathe so much better and can run long distance now. i actually dont make resolutions since i never achieve them! spare myself the disapointment and excuses! My most successful New Year’s resolution was to do something outside of the box every month of the year. It was a very fun challenge and helped me realize that even things that I thought I may never be able to do not only were possible, but could be inspiring to others in my circle of family and friends. I decided to lose 40lbs before my 40th birthday and I did it! My most successful resolution was to not make New years resolutions (and I’ve been able to stick with that lol). I don’t believe in New Years resolutions 🙂 They rarely work out and I don’t need the added pressure. To stay active and exercise at least 5 times a week. I have been able to maintain this and I usually do some form of exercise every day. To NOT make any New Years resolutions! I don’t have any successful New Year Resolutions, and my biggest failure is always weight loss. My most successful New Year’s Resolution was to apply for any an all movie extra work. My most successful resolution was to write more letters. My biggest fail was I did not ride my bike as much as I intended. My biggest success has been my work day exercise improved over the last year. Starting a swim exercise routine! To not have any negative people around me. Success although some try. My biggest success was being able to travel more. I had a resolution to drink more water for my health, and I’ve been doing well with that. My most disastrousresolution was to lose weight. I made it every New Year’s Eve & FAILED for about 10 years! hahahaha I don’t make resolutions anymore. Defiantly eating at home more and making healthy food choices! I totally met my goal. Getting ride of clutter and things I never use. To never make New Year’s resolutions – SUCCESS!! Oh wait – FAIL!!! One year I made a resolution to move away and I did. One year I resolved to be more environmentally friendly – use less paper towel, plastic, etc. I did ok! My New Year’s resolution for 2018 was an epic fail. I planned to lose 20 pounds and instead I gained another twenty. My most successful resolution was to not smoke any cigarettes. This was very easy as I never started smoking! I was supposed to exercise more…the first week was great….and there was no exercise after that week! My most successful New Year’s resolution was to cut down on too much snacking and drinking less beverages like soft drinks, worked out great so far :). My most successful one was becoming more active … my hubby had the same resolution and we kept each other accountable. Most successful was to spend more time with the kids without electronic distractions. Least successful was giving up pop and chips. Oh how easy it is to fall back on bad habits. I suppose my most successful resolution, years ago, was to take a few wine appreciation courses. Learned a lot and met a lot of interesting people. To be a kinder person to others. Did well with that one, especially with my parents. Didnt do as well with trying to be more active. I resolve to not buy gym memberships I never use and instead walk to work. It saves money on gas, wear and tear on veihicle, vitamin D capsules and costly gym memberships. What a win! To try and put my feelings first, sometimes. My most successful resolution was to treat myself better and take more care of my health. I gave up broccoli!!!! Too easy!!!! Most successful resolution was to eat more plant based meals, still doing it! Best resolution to make time for me, no matter how small. Great prize pack! I don’t make new year’s resolutions! I just never felt them to be realistic! My most successful New Year’s resolution was and still is being more understanding with my kids. My resolution is the same every year – to lost weight and get organized = fail every year! To be more positive, always let the ones you love know how much they mean to you. My most successful resolution was to travel more!! My most disastrous fail is not making any New Year’s resolutions at all. To not make any more New Years resolutions! My most successful New Year’s resolution was to cut back on sugar. I have since stopped drinking cola altogether! Not eating anything made with white sugar, failed! To finally graduate from university and find a job! Quite a few years ago I quit making resolutions that I always broke that made me discouraged. Now instead I do something extra each day that makes my life or the life of someone around me better. I have lost track of how many years I have done this but I get more accomplished and feel better about myself because of it. To be less stressed out and anxious. Not sure if I’m succeeding in this one yet! I always seem to have a resolution that I am going to lose weight, I start off right then it doesn’t happen. I have learned to except myself for who I am!!! To find a part time job! To find a balance between work and home life, and have both be where I excel at either of them. Committing to saying yes to everything within reason. It ended up being a great year but I did break a vertebrae as a side effect lol! I guess I’m a bit of a bore because I don’t make new years resolutions I’m afraid. My resolution was to set limits on what I am willing to tolerate from others. To make decisions for my happiness. Not others. I am flossing every day. That I was able to payback my student loans in full. Best resolution – be kind, to others & myself. It works, life seems a bit less stressful! To help as many stray cats as we can, we live in the country and people are always dropping them off even pregnant cats. So we take them and get check and get the fixed before finding them homes. Last year, I committed to take more time to read – just for the pleasure of doing so. As a writer, I am reading all the time by way of research but, though informative, it is often not by choice. This past year, I have read over 50 books and continue to go to bed earlier at night so I can read more. Thanks for the super giveaway opportunity. My most successful New Year’s resolution was not drinking softdrink anymore! My most successful resolution was to lose weight by cutting out potatoes, rice, pasta and breads. I ended up losing 40 lbs. and have kept it off for 3 years. I still eat very little in the starches, success! FAIL – quit smoking never works for me. I am trying to eat healthier – less salty snacks and more fruit in my diet. My most successful New Year’s resolution was when I decided to put my energy into being positive even when those around me may not be. I wanted to lose 30 LBS a few years ago and by day 2, I had forgotten the resolution because I was too busy. I’m thinking of starting resolutions in November to be ready for the new year! November is a quieter month! My most successful New Year’s resolution was to live a healthier lifestyle which included diet and exercise. I lost over 30 pounds and have been able to maintain it! I want to exercise more and eat well! To be more present in the moment. Sometimes Im great at it; other times not so much! My best new year’s resolution was something I wanted, but came about somewhat unexpectedly. However, I was very grateful to be able to extricate myself from the “rat race,” stop working for other corporations and start working for myself. I reduced sugar intake and I feel weel. Years ago I gave up smoking for the last time and it worked. To quit smoking 6 years ago and I did. Peppermint Candy Cane Forest – love the Body Shop. I fail at this, so don’t do any resolutions! I always vow to get out and exercise more. Start out great but then after 4-5 months I start slacking off. Will try again this year! To work out 4 times a week! I mostly did it. My most successful resolution was to not make any resolutions! To get into shape and eat healthy. Fail. I lost the weight that I wanted to! To take better care of myself. To give more of myself in service. I have increased my giving a little more each year! Il y a 2 ans perdre du poids (pour raison de santé), cela a très bien réussi, je ne prend plus de médicament. I don’t really make New Years Resolutions but I have been trying to eat better and loose a few pounds so maybe this Year!! I am trying to reduce stress levels. Most successful – quitting smoking. 6 years this coming January. My most successful resolution was to be the best me possible. It’s a continuous work in progress though. There’s always room for improvement. My most successful was to clean the bathroom and Kitchen sink at least once a week. I have kept that resolution for almost 10 years now. I had a resolution to cut down on caffeine and sugar. So far, so good! It was to “try” to get more sleep. My most successful was quitting smoking! To be less critical, was so successful my 2019 resolution is to give a dam. My most successful was to see more live theatre! It was a great time. To give a compliment to someone everyday. Costs nothing and means so much to people. My most successful was when I decided to quit smoking!! Still smoke free! Drink more water: easy ! We adopted the cutest little bulldog ever. We are so happy. 4 years ago, was my most successful New Year’s resolution. It was to finally follow my homesteading dreams and leaving the comfort & safety of the city, to start living the life I had always dreamed about. It took me over 20 years to get courage to follow that dream and now I’m living it. My most disastrous fail was to stick to a budget for the entire YEAR. It didn’t work out the way I had anticipated, I did learn a lot. No alcohol for three months after New Year’s was a great contributor to weight loss! No resolutions have ever been kept! Impossible demands, like quitting smoking or drinking- just can’t do it, because, hey, i am no quitter! I stopped making New Years Resolution because I constantly failed! I made small goals and one goal was to take the time to read a novel…and I am on my third one for the year. I never seem to have the time to read but making the time everyday however small has really helped. To kick cancer and I did it!! I don’t make New Years resolutions. If I want to make a change or improvement to my life, I focus on it right away. Why leave it until January to start? I vow, and fail, every year to be healthier. Sigh. My most succesful was to start eating better….I realized that the yo-yo dieting thing I kept doing was absolutely not working, and would never work. I foccussed on eating things that were healthy and tasted good, instead of focussing on the things I shouldn’t eat. That really helped, because I didn’t feel so deprived. Thanks for the chance! I have lots of ideas and supplies for craft projects but nothing seems to ever get finished. 2019 will be better?? but failed so many times. Finally, success as I quit smoking 2 years ago. My most successful resolution was to take time and connect with my friends. My most successful New Years resolution was to stop drinking pop and although hard at first was easy to follow through on. My New Year’s resolution is to get more sleep and stop worrying! My most disastrous fail was trying to quit smoking. It only lasted a few days, but I am going to give it another try this year. Hopefully it will be a success. A few years ago I vowed to read more books and watch more TV. January went great – I started and finished 2 books I’d been wanting to read….but that was it for the year. I peaked in January lol. To devote more time to my kids, rather than my work. I joined my kids’ daycare board of directors, volunteer for school field trips, and coach on their soccer and baseball teams. Best resolution I ever made! Both my husband and I stopped buying and drinking pop. To find some “me” time! Thanks! Happy Holidays! I resolved to take more risks – success – my family and I moved cross-country this year and have started to build a new life in a new town. It’s been fantastic so far! To lose weight! FAIL FAIL FAIL. In every aspect… I don’t eat healthier, fail. I don’t exercise, fail. I don’t control my portions, fail. I resolved to exercise daily and have found a way to build that into my day. Trying to do more cardio – I hate sweating! One year mine was to learn the meaning of “patience” and it definitely seemed to help my lack of patience! My most successful NYE resolution has been losing 134 lbs! So thankful and happy to have my health back! My epic fail was planning to go skiing every week last year. It just didn’t work out. My usual resolution is to be more healthy by drinking more water, exercising etc .. this is an ongoing thing ,sometimes I do well , and other times , not so much . My resolution was to worry less about things that I can’t control. My most successful New Year’s resolution was that I was going to find a better job, and I did! I decided to make time for reading everyday and I find it so relaxing. My most successful New Year’s resolution is to get my health better, so i can enjoy the New Year 2019 better!! with all my loving family and friends. “Merry Christmas” Tribute.ca and “Happy New Year! To do yoga or Pilates at least 5 days a week. Success so far! I resolved to walk for 45 minutes 3 times per week and I stuck with it! J’avais décidé de m’amuser un peu plus dans la vie quotidienne … Assez bien réussi , mais en 2019 je vais continuer à bien vivre . Found out I was pregnant around Christmas in 2010 and my New Years resolution was to quit smoking. I haven’t had one since. My goal was to pay off our mortgage and I did! Every year my resolution is the same….lose weight. This year I was finally successful and have lost 38 lbs! My next resolution will be to actually go to the gym! My New Year’s resolution to be punctual has had some success, but it need more work in 2019 ! I quite smoking many moons ago. I gave up on making New Years resolutions. I always fail. No will power. Best resolution: spend more time with friends. Easy to meet, and hard to argue with the benefits! TO NOT MAKE ANY MORE RESOLUTIONS!! I’m going to be more active! My most successful new year resolution was to exercise daily. Simple but effective. Went walking / hiking more with my wife and dog. Most most successful new year resolution was to go to bed every night before midnight to improve my health. My most successful new year resolution was to eat healthy every day, such as fruit and vegetables to improve my health. My most successful resolution was to act more confident in everything I do. My most successful resolution was to do everything to the best of my abilities from now on. My most successful resolution was not to make one! Don’t make New Years resolutions. Try to improve year round. Run a half-marathon…and I did it! My most successful resolution was to find more time for relaxation. My most disastrous New Years resolution is going to the gym to exercise. I make the same resolution every year and never follow through! Maybe this year I will try something different. This coming Boxing day I will be 3 years alcohol free. I resolve to spend more time with family. My most successful New Year’s resolution has been this year 2018 – when I endeavoured to be less sarcastic. I have been very good this year. Every New Year I resolve to eat healthier, take better care of my diabetes and exercise. My New Years resolution was to make sure that those people in my life know how important they are to me. I think I did fairly well but there is room for improvement. I hope I win so I can share these gifts with my loved ones. I make resolutions to lose weight, eat healthy, exercise more, etc. etc. and only stick to it for a few days and then it’s a failure. I have stopped making resolutions, have a positive attitude and looking on the bright side. To lose 40lbs of weight and to fit into my old clothes. My worst New Year’s resolution was to read more, buy it failed because my wife didn’t like the subtitles on all our favorite television programs. My most successful resolution was to not sweat the small stuff… and that has greatly improved my life! Most successful resolution was to quit making resolutions,and just try to do my best at whatever I do. To exercise more and get fit. Get more sleep, but it never happens. Most successful was drinking less cola and losing weight! Being more active…walk every day or participate in a yoga or exercise class. To eat better and cut out the chocolate. Yeah- right. my most successful resolution was to eat less junk food, it’s always harder if you cut it out completely. I made consciously choices to eat more naturally, such as plain oatmeal vs a packaged flavoured one. My most accomplishing new years resolution was to follow through on my promises and get in shape and that I did this year running multiple 5k and 10k races! I completely fail at making New Years resolutions! I don’t think I’ve managed to keep one!! I don’t make resolutions. Thank you for the chance to win! I don’t make resolutions, so no successes or failures for me! To cut down on sugar. Semi successful. To walk three times a week. 2 years ago I made a resolution to find a new/better job. I did it by April 🙂 Still extremely happy with the place I’m at now. Not to lie to myself or others about my New Year’s resolution, which was to continue being a good person. To say yes to more fun! Most successful is working out! To walk 5 miles a day! My most successful New Years Resolution was “Eating Healthy”. To be more active and I was very successful. I resolved to quit smoking and I haven’t smoked since February. To go outside for at least 15 minutes every day! Be more active – Success! I made a resolution not to make any resolutions. 32 years ago I made a resolution to quit smoking (after smoking for almost 20 years). It was the most difficult thing I have ever done, and it took more than one try. BUT… I DID IT!!! I haven’t had a cigarette in over 31 years!! My most successful New Year’s resolution was to save a dollar a day in a new way for a month. quitting smoking was my most successful resolution..
My resolution every year is to lose weight and I’m still trying!!! My most successful ever was to go for long walks on most days and I do that now. I did manage to lose ten pounds, drinking fewer colas and less sugar. My successful one was to quit smoking. MY most successful resolution was getting back into the gym! Two years later I am still la ‘regular’!! To not wait for a New Year to make a resolution to change. My most successful one was to exercise MORE and be more active! My New Year’s resolution is always the same, be healthy!!!! FAil was to Stay in shape and lead a healthier lifestyle. To take more family pictures – as looking over pictures taken years ago, they give one very warm memories. I don’t make New Year’s resolutions. Hate setting myself up for failure so early in the year. My most successful New Years resolution was to get together with friends more often. To stay on my ever ending diet ! My resolution is to no longer make any resolutions! Life is too short! Finally something I can stick to!! To get in better shape! Many times I tried quitting smoking, it finally worked. To love the skin I’m in. To go organic. Best thing I’ve ever done. I did resolve to avoid sugar and deep-fried foods–and managed to continue for 5 years. My most successful New Years resolution was to let go of a lot of anger I held and try to my best to be a happier more forgiving person. I resolved to drink more and remember less. Mine was too lose weight but epic fail I gained weight so sad!!! to not make any more new year’s resolutions! Stay away from negative people and have gratitude every day & thank God for all the good and bad things that happen on a daily basis! To give up junk food. Unfortunately it never lasts long because I love fries! Best resolution? Well, working on it: resist the temptation to provide my daughter with unsolicited advice. Its more difficult than it sounds as one always wants what’s best for their kids lol! My best resolution was to start meditating. My worst was to give up junk food – NOT! I’ve never made a serious resolution. To be more productive before 7AM. It went well for about 6 months then collapsed. But at least I tried?!? I am not to fond of New Years resolutions but I do always try to be kinder and happier every year. My most successful New Year’s resolution was becoming a vegetarian. To be more contentious in how I spend my money! Exercise and eat health more. My New Year’s resolution last year was to create a log of my spending – it never happened! Stress less. Don’t sweat the small things in life. Live large. To be happier…I’m really trying! Epic fail- running 5km daily for a month and then start adding km until the summer… lasted 2/3 through the first run! my most successful New Year’s resolution was quitting smoking in 2010. My most Successful New Year’s Resolution was not using ANY of my credit cards this year anymore and to continue paying down my credit card debts!! To get in shape.. fail. Mine has been to say yes to more opportunities, somewhat successful. I am going to try and swear less. Mine was to take more self care time, and I have been able to do it most weeks. My resolution was to travel more and I did take a few trips this year. Quitting smoking (will be 8 years next month) cold turkey! My best resolution is not to make a resolution at this time of year. I prefer to make resolutions at a time where the pressure/stress is less like spring time or September. Drink more water easier said than done. My most successful was last year’s – resolving to spend more time with my children, and enjoying them and their activities, instead of worrying about the chores that were not getting done. Being there for my mom like she has always been there for me. I’ve learned not to make New Year’s resolutions. I try to be a better version each day! I learn something new, help another human, volunteer… Happy Sunday to All! Take a trip for my birthday. Did it & it was wonderful! My best (past & current) resolution is just to be more present everyday of the year! I strive to lose weight but it doesn’t always work out. To find a really good 2nd husband and after 24 years of widowhood, I did. P.S.The first one was great also. to not drink alcohol…lasted about 2 minutes because i rang the new year in with a glass of champagne ! resolved to live more presently and think i’m doing a good job! Most successful resolution I’ve had would be to not sweat the small stuff! To get outside more would be the winner…all the others fell aside quickly. Save more money towards buying a home. I was determined to learn something new three years ago. This has been my resolution for the past three years. I have FINALLY taught myself how to skate, I’ve relearned how to ride a bike, and my next challenge is to learn Spanish which I’m learning. To eat healthier and eat less chips and popcorn. It’s always an epic fail for me and I usually only last a few weeks on the chips and popcorn part. Most successful resolution was reinventing my marriage. Eating more healthy…. FAIL because it’s too expensive and there’s too many chemicals and additives in veggies and fruits bought in store. Trying to go vegetarian. Not a success but I have cut down on my meat consumption and I no longer drink milk. It’s a start!! My new year’s resolution was to eat healthier. I had attempted and it lasted a whole 3 weeks. I started a second job in that time and wasn’t meal prepping which is really key to staying on track. every year i start off by promising to eat right and lose weight but after the first few days i always seem to lapse back to my old ways! Mine for years was to quit smoking finally it took now its lose weight, just waiting for that one to take. To take on day at a time and not to worry about things that I cannot control. To take a step back at work which reduces my stress. It works for me. My resolution was to never make resolutions, and so far so good! Most successful was to spend more quality time with friends and family. Working great so far. My resolution is to go visit more people, write more letters and play more with my cat! I lost 50 pounds and have kept it off for four years now! My biggest fail was to lose weight. I started out well enough: going to the gym, eating healthy, but it didn’t last long. To spend more quality time with family. To start meditating and doing yoga. I was successful kind of with yoga but still struggle with meditation!! BEST EVER WAS TO QUIT SMOKING: done 3 years ago, and never ever going to start again! I was able to loose 30 lbs in the first 5 months ! Last year to lose weight and I did 50 pounds and still going strong. Eat better and take care of myself. Last year it was to reduce my intake of sugar, and I did succesfully! Drink more water, less wine, and I did it! Showing love and grace to others and always remembering KINDNESS & LOVE is the only way to live! My most successful resolution is related to our dog. We pledged no table scraps and to walk her daily or take her to the dog park. It helps that Roxy is relentless as she will stare us down, if we don’t move to the door to go out! I wanted to pay off my mortgage by the time I was forty! Succeeded! I made a resolution to read more books this year than last year. Last year I read 12 books and this year I read 14 so far and I’m aiming to finish one more by the end of this month, making it 15 for 2018. Success at not making resolutions. My biggest fail is trying to go to the gym. To do more walking to places. Successful – To quit smoking permanently effective Febuary 2nd, 2011. Good luck to everyone with the resolutions this New Years! I don’t make resolutions. Nothing to break and feel bad about. Hi. I finished a 4-part online course. I lost 26 pounds this year! Finally back to a healthier weight. my best resolution is that i worked really hard, brought many dreamed gifts for my brothers and sent money to my parents.. I always think about dieting or exercising more…never happens! Oh well…next year!! My most successful New Year’s resolution was to stop drinking so much soda. I managed to only stop by switching to carbonated water. Get outside more and enjoy nature. Love being outside. Cut down on potato chips…. still trying. Every year I always say I’m going to get in better shape & start working out but it never seems to happen other than getting out for daily walks with my dog. To eat more greens and drink more water! Fell off the wagon a couple of times this year but so far so good!! every day I call a lonely friend or an old relative, to say Hello and keep in touch! THANKS! I didn’t make any, just made the commitment to eat healthier, pay down debts, and be grateful. To stay calm at work in stressful situation but loosing weight was a no go. My favourite Resolution, and I use it almost every year, is to simply “Smile More.” I make an effort to remind myself to simply “put on a happy face.” It’s a resolution that works for anyone and will benefit everyone. Two years ago it was my goal to learn how to crochet. I stuck to it and I’m in love with it. I’ve never been happier and I’m so glad I stuck with it!!!! My successful resolution this year was to spend a lot of time with my sister,and I am glad I did she passed in August. My most successful New Years Resolution was to lose weight. I ended up losing 30 lbs in 3 months! However, it turned into my most disasterous New Years Resolution because I gained it all back, and then some! To stop smoking – that didn’t last. I haven’t made a resolution in all seriousness; I figure if you can’t do it any time during the year; New Years won’t make a difference. To be a better friend! My least successful resolution was trying to say no more to my friends. To stop eating McDonald’s Big Macs! I haven’t had one since 2007 and dropped over 30 lbs. that year alone!! Drink more water and walk around the block! my most successful is making my nieces happy by getting whats on their christmas lists. the joy, innocence and happiness is without measure and the best part of the holidays for me. My new years resolution was to be more positive and even though 2018 was a very hard year for my family and i, we are still trying to look on the bright side of things. My best resolution was to improve my GPA and I was able to do that! I made a resolution to quit smoking and this New Year’s Day will make 20 years smoke free :). my most successful resolution is to not make any resolution. My most successful resolution? Not to make any resolutions! My most successful resolution was to spend more time out with family regardless of being busy with work and feeling too tired to do much else. not being late for work!!! I didn’t make any resolutions as to not disappointment myself! I enjoy It’s a Wonderful Life. Quit smoking….finally worked. Smoke free for many years now! I will try to not let the little things bother me so much, good luck to me!!!!!! When I would say “I will get to it …..” I used to put it off. One year I made a resolution to do things immediately. It was great! My best new year’s resolution was to not make new year’s resolutions! Quit smoking I quit years ago and thank God everyday – people are killing themselves smoking and blowing hundreds of dollars a year – up in smoke. I saved the money and went on a fabulous trip after the year being smoke free. Definitely sticking to my weight loss goals – I seem to fail year after year. To begin a health regimen. Failed resolution – to quit smoking – lasted until my hangover disappeared! LOL But 4 years later finally success!!! To spend more time and effort helping others. My most successful resolution was to watch more movies. For years I always made a resolution to lose weight, however, I never followed through. To make a new recipe every week. To start saying ‘no’ and start doing more for myself because I always tend to do everything for everyone else! My most successful resolution was to work harder on my side projects – I’ve done very well this year and I’m happy with how far I’ve come! And looking forward to even more growth to happen next year! My most successful New Year’s resolution was to eat healthier, especially at breakfast time. I now alternate breakfasts between various fruits with Meusli and Mediterranean yogurt and my special oatmeal that includes an apple, flax seed, wheat germ, chopped walnuts, dried cranberries and raisins. I’ve even discovered I like kale. Who knew? To save money for the future. Cutting a toxic person from my life. Put money in my savings every week! To drink more water! I made that resolution 2 years ago, and I still commit to it daily. My most successful New Years resolution was to not make New Years Resolutions. If I have a goal in mind I start it when I decided to. Most New Years Resolutions fail. I wanted to learn how to knit and I succeeded! I also wanted to do more exercise! That was also a success! to take more time for myself. Self care is extremely important. I have never had a successful New Year Resolution. Most they were to lose weight. A waste of time. I took up running as a new years resolution and I trained to complete a marathon at age 50. Best resolution was to stop making resolutions!! Both the most successful and most disastrous was to get more organized. Started with bold moves however, still somewhere in the middle. My most successful resolution was to quit smoking. It stuck and now I’m smoke free 8 years! About 8 New Year’s ago I gave up fast food as one of my resolutions! For the most part I’ve stuck with it! I only eat Subway if I’m going to get food! My most successful New Year’s resolution was to quit smoking. That was 3 years ago and still a quitter! Save save save to buy a house and that we did in 2018! My most successful resolution was my 2018 resolution to loose 100 lbs. I lost 120 lbs and still counting. My most disastrous New Year’s resolution was to save money. In fact I went further into debt and saved nothing! This coming year I vow things must change! Not take things so seriously and slow down… it really helps! To just enjoy the small things! Stress less! Laugh more!! To see the glass as half full rather than half empty. To be grateful,to what I do have rather than what I don’t have. I resolved to take time to reflect on what I’m thankful for more often! I’m going to hire a trainer for 2019. I year I said I would read a book a month for the whole year and I ended up reading 15 books that year! I should do that again. I usually forget about my New Year’s resolutions about a month into the year but this year that was not the case. I had badly injured my hip and leg about 2 years ago and my goal was to get my workouts back to 4-5 times a week like before that happened. Still a little inconsistent but night and day to what I was last year so yay!! I don’t make any resolutions …. life is so short that I live every moment as if it was the last one. To send little gifts to friends and family. Just a little something to brighten their days. It has been a success. Sometimes successful and sometimes not so much is mindful eating! Not just doing it for the sake of doing it if I am not really hungry. Most successful start an exercise program. Was a resolution back in 1990 and I did aerobics classes faithfully until 2004.
to recognize that live gives us all different challenges and too keep my expectations of others reasonable. Quit smoking. Which I did…. My failure is to lose weight every year, however I always fail. My new resolution is going to be healthy in general, exercise more, eat more healthy, and make sure to take care of myself mentally. I made a resolution to hit the trails more often! I sure did this year and got many friends to go along! it was a successful resolution for 2018! the same one every year for the last ten to lose weight..major fail! Live life and stop stressing. My most successful resolution…enjoying every single day of the year and not just the so-called milestone dates. at home or at my dance club or anywhere! To get more sleep – not happening so far. My most successful New Year’s resolution was to travel and enjoy every minute with what this life has to offer me. My greatest revolution was finishing my degree; currently in school and making that dream into a reality! Going back to school!! I graduated last JULY!!!! I made a promise to look after myself more so now every month I get a theraputic massage and my nails done. It’s my gift to me. My most successful New Year’s resolution was to quit smoking. Thanks for the chance to win! Merry Christmas! This is an amazing giveaway! I was successful in saving for a trip. My most successful New Year’s resolution was purging all the junk in my basement. 2 years ago my resolution was to complete the couch to 10k running program & run in a real race & I did it! Last year it was to drink more water. Partial success. My best resolution is to do a good deed for someone every day of the year! It has been wonderful! I started champix on New Year’s Day and officially stopped smoking on Jan 23rd. It will be 10 years this January. To volunteer more and I do at the Toronto Humane Society! to do more exercise. I bought a bike and I go biking 3 times a week. I did’nt make bike since 20 years ago. To eat healthy and stay active. The best New Year’s resolution I ever accomplished was actually for my dad. I got him to quit smoking. I was only 9 years old at the time and I had seen videos at school of what happens to someone’s lungs who is a heavy smoker. I begged him for New Year’s to please quit smoking and he did. It took two years and many nicotine patches, but he has been a non-smoker for over 20 years now. To drop people that do nothing for me. Focus on me – don’t let the petty crap get me! So far so good! Write a book before my 50th birthday- and I did it! My most disastrous resolution fail is getting active. I always fall off the wagon around Valentine’s Day and stay off the wagon! To not stress so much over the small things – trying!!!! find a better work/life balance – Success! I once tried to save money every day. The “day of the year” thing. So day one, put aside $1, day 2 $2 and so on. I lasted about a week! Lose weight. You know, the one I make every year. I made a resolution to never make New Years resolutions again almost 30 years ago. I have never broken that resolution. To stop and smell the roses more. To stop smoking which would benefit my health. I finished my Family Tree back 10 generations! I never make resolutions since I make changes to myself and life throughout the year. I actualy started to lose weight just before Christmas and ended up continuing my weight loss into the new year. I lost 60 pounds, it lasted for about a year after that and then I gained it back. Epic fail! Learn guitar – took lessons and found out my fingers aren’t nimble enough to play!!! BUST! My best resolution was to give more hugs! Eating healthy a few years back. Fallen off the wagon must get back on track. I try to do a good deed for someone every day. It sure makes me feel happy! My resolution is to be proud to say I actually accomplished something good for myself. My best: To spend more time with my elderly mother. I am so glad I did so. She’s gone now and I miss her every day. My best resolution was to connect with my family more by calling them weekly. It’s worked. I always look forward to talking to them as I live so far from home. My best was to quit smoking. I accomplished this 15 years ago!! That time I swore I’d give up cheese. What was I thinking?! Still trying to lose weight…LOL!!! I gave up tea because of the caffeine! Best resolution I made was to do something in 2018 out of my comfort zone. Decided it was gonna be sky diving. One on my birthday. mY MOST SUCCESSFUL nEW yEARS RESOLution…..DON’T WORRY BE HAPPY!!!! MERRY CHRISTMAS TO ALL. To quit worrying so much – pretty hard not to do! To look on the positive side of things and encourage others to do the same. I gave up diet coke. It lasted 3 days. Most disastrous fail – trying to control the paper/clutter in my home, year after year. I don’t make New Year resolutions. I was trying to organize my many books/collections – and I actually did it! A great resolution! My best resolution was to put my self first. It changed my life and everything feel into place after that. Host gifts are not bad or for people you don’t really know too well. My most successful New Years Resolution was eating less processed foods. I have cooked more, eaten raw more and I definitely feel the difference! Thanks for the chance Tribute and good luck everyone! To read more – and it was very successful! Exercise more eat less sweets, incorporate more healthier options. I’ve tried to read more and it’s not worked so hot. Fall in love with a great woman from anyplace in the world . . and I did from Hong Kong!!! New movies in theaters – Bumblebee early access and more!